Silver Creek Outdoors specializes in waterfowl hunting, supplying professional guides and field trial quality Labrador retrievers. We are a licensed outfitter located in southern Saskatchewan, in the midst of 2 major flyways for migratory birds. Hunters are housed in comfortable lodge-style accommodations complete with gourmet cuisine. Silver Creek is also home to artist Jack Cowin. Come experience the beauty and hospitality of Saskatchewan and see why Wildfowl Magazine® and Retriever Journal® report hunting here as "simply fabulous." Pachanga Labradors are a select group of highly trained, field trial quality Labrador retrievers representative of the best of their breed. Pachanga Labradors has produced the former all-time high point chocolate Labrador retriever FTCH-AFTCH Pachanga Magnum Force. 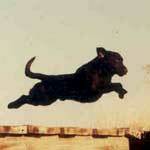 Puppies, started and finished gun dogs are available and can be shipped internationally. Is dedicated to showing our clients the finest waterfowling North America has to offer. The hunting season runs from September to November. 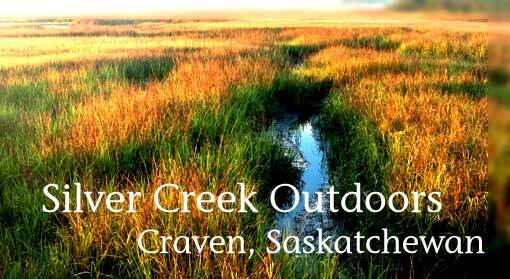 Silver Creek is located in the heart of the Central and Mississippi flyways. We see an incredible number and array of ducks, geese, and cranes. 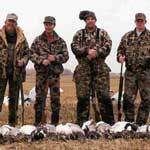 The sheer population of waterfowl makes hunting here world-class. Our Labrador retrievers are outstanding and love to work. Hunters are welcome to bring their own dogs. Clients are looked after throughout the hunt by knowledgeable, courteous guides.